Are you subjected to unwanted noise? Quickly set up a monitoring session to record noise. ‘Noise Monitor' has low disk and battery usage with background and screen-locked recording enabling you to monitor well in excess of 12 hours. 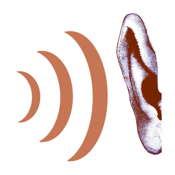 Noise is colour encoded so that you can visually identify similar noises throughout the monitoring session. Noise is analysed for you by determining the instantaneous audio frequencies of the noise and mapping it onto the colours of a rainbow. On the top instantaneous graph up to 6 frequencies are displayed with the highest intensity frequency in the middle of the line and progressively lower intensities on the outside. The bottom graph shows you a summary of the entire monitoring session. The vertical bars here summarise an interval with the highest intensity peak colour during the interval at the top of the bar and the next highest shown at the bottom of the bar. Similar noises show you similar colour patterns though louder noises will show in brighter colours. 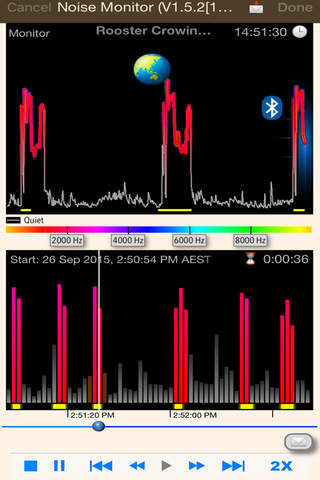 The yellow bars at the bottom of each graph show where the app has detected a noise peak. Fast review features save you time: Visually review noise, selectively replay noisy sections, skip and play noisy intervals, double speed playback. You have at your disposal further additional features as required: ・ Change the audio frequency range to analyse ・ Capture and email of the monitoring and playback screen ・ Remote monitoring over iCloud drive ・ Emailed periodic updates and noise alerts ・ Alter the conditions that trigger a noise alert ・ Export 48000Hz copies of monitor recordings to Documents or iCloud Drive ・ Email download links to recording copies in iCloud Drive using iOS mail ・ Email of download links to guaranteed unaltered copies ・ Use of location services to prove where the monitoring took place Note: If the noise you are wishing to monitor is barking dogs then please have a look at our premium dog related app "Bark'n Mad".